Whiskey barrels are in! There are so many cute and fun ways that you can incorporate whiskey barrels in to your wedding day. Not convinced? 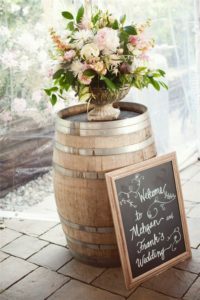 Below you will find a few great ways to use whiskey barrels on your big day that will leave your guests talking for days! Your guests will look for a welcome table where they will find your guest book, a gift table, or even a place to leave a kind note for you and your new spouse. Instead of using a folding table and a table cloth, utilize an aged whiskey barrel that has character! Add a nice floral arrangement and you’re good to go! Regardless if you choose to have alcohol at your reception or not, you will need a place for your drinks. Instead of relying on an unstable table that is easily bumped over, try adding two whiskey barrels with an old door or rustic piece of wood over the top of them to add a special touch to your drink station. You can get creative here! There is no right or wrong way to set it up. In generations past, cake tables have gotten over looked and have not been capitalized on for photo ops. Cutting the cake is typically a major part of the reception timeline. Usually time, money, and effort is placed on making the food/buffet presentation stellar, which isn’t a bad thing. However, your cake cutting shouldn’t be dull and boring! Try using a whiskey barrel to create a stand alone showcase for your wedding cake. If your cake is too large for the whiskey barrel, try using the barrel for the groom’s cake! You won’t be disappointed in your photos when you get them back! If you need a whiskey barrel or two for your wedding day, Bradley Rentals in Cleveland, TN has you covered! Give Valerie a call for all of your wedding rental needs. ← Getting Married This Fall?